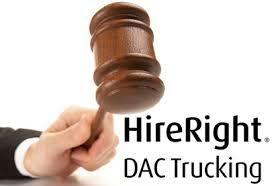 A DAC class action lawsuit was filed against HireRight AKA DAC in Virginia. You are a member of the Settlement Class and are affected by the settlement if you applied for a job where the prospective employer was supplied with a background check generated by the Defendants. You can find more information below. The Court will hold a Fairness Hearing on November 3, 2011, at 10:00 a.m., in Courtroom 6000 of the United States District Court for the Eastern District of Virginia, 701 East Broad Street, Richmond, VA 23219. At this hearing, the Court will consider whether the settlement is fair, reasonable, and adequate. If there are objections, the Court will consider them. The Court will listen to people who have submitted timely requests to speak at the hearing. The Court may also decide the amount that Class Counsel and Class Representatives shall be paid. After the hearing, the Court will decide whether to finally approve the settlement. You do not need to attend the hearing, but are welcome to come at your own expense. exposed to the rest of America by the Department of Justice. (1) failing to provide consumers with notice that they were furnishing an employment-purposed consumer report “at the time” they were doing so; (2) failing to follow proper procedures for providing information to consumers upon their request; (3) failing to follow proper procedures for initiating and resolving consumer disputes; (4) failing to timely update employment applicants’ criminal record histories to show that such records have been expunged; and, (5) failing to ensure that criminal records were not duplicatively reported in a single background check report.